Ferns are a plant widely used in landscaping for the decorative foliage, as well as the ability to grow in shade and damp areas . They are generally very low maintenance which makes them a great landscaping plant in the right position. One of the more popular fern varieties available from any good fern nursery is the 'Birds Nest Fern' or Asplenium nidus pictured right. Most gardens with large trees or sheltered shady positions can easily accommodate a few ferns, and remember that ferns can add to the tropical garden as well as the temperate and cool climate gardens. So what makes a Fern A Fern ? It is the way that they reproduce. Although ferns are a vascular plant, howver they are unusual in that although they have tissue that conducts water, they do have produce flowers, fruits, or seeds. They reproduce by spreading spores. Some will form clumps and can be divided. Ferns are also one of the oldest plant forms dating back over 300 million years. With over 10,000 species care requirement do differ. Some are much hardier than others, some are reasonably drought tolerant and light conditions vary greatly. Moisture in both the soil and the Air. And with so many different species this differs greatly. Individual care notes are provided on linked pages. Some ferns are terrestrial, they grow in the ground. Others are epiphytic, they grow on trees, so major differences between varieties here. Some ferns are small and dainty with lacy foliage, others are large with course foliage such as the tree ferns. And some cope well in full sun and dry conditions such as the Bracken Ferns. Adiantum aleuticum - The very cold hardy Western Maidenhair fern. Athyrium niponicum 'Pictum' - The colorful Japanese painted fern. 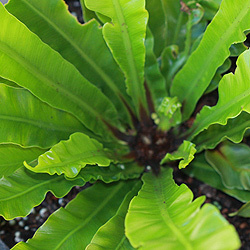 Asplenium scolopendrium - The Hart's Tounge Fern, one of the best for vertical gardens. Cyrtomium - These are called 'Holly Ferns', excellent for deep shade. Polystichum munitum - The Sword Fern, excellent for sunny positions. Cyathea species - The wonderful 'Tree Ferns' from Australia. Dicksonia antartica - The soft tree fern. For the average gardener the easist way to propagate ferns is by division, as propagation from spores is difficult. Some ferns to produce small bulbils on the foliage which can be used to ariel layer.